As a friend of FLATSIXES.com we've featured Jack Olsen's car before, and he has written for us in the past. For most of you this won't be the first time seeing Jack's 12 Gauge Garage. However, this will be the first time you'll see it completely with the reasoning behind each design decision, straight from Jack. To fully understand what makes his garage so special, however, I'd like to contrast it with the much larger garage which my family shared for decades. 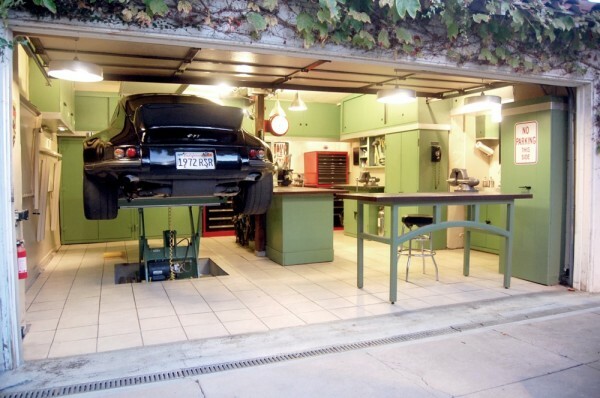 Jack's garage is designed around his 911 and maximizes the limited space found in a two car garage. Our garage evolved over time to house a wood shop, storage for about seven motorcycles, three hit-and-miss engines, a cider press, and still incorporated space to work. They are very different spaces, but to me its easier to understand Jack's achievement in the context of a more "normal" garage. While a large part of the difference comes simply from the number of users. Jack's "12 Gauge Garage" was designed primarily for him. Named for the thick steel in the garage's Stronghold cabinets, Jack's garage is designed from the ground up to be organized and efficient. The lift is recessed fully into the floor. The worktops are steel and designed to withstand punishment. Each item has a place, and thanks to the layout each item can return there quickly. Pardon the lack of Porsches. This is the only picture I have of our full garage, and my 356 was in storage at the time. Our shared garage, on the other hand, was not designed. Our garage evolved over decades. While every item had a home, and as many things as possible were left off the floor, the simple fact that one user was a legally blind nonagenarian made organization a challenge. Jack's space was designed around his 911. Ours had to accommodate any vehicle, including trucks, tractors, dirt bikes, motorcycles and cars. Of course our garage had its own furnace and oil supply; a boon for us, but something which Jack likely neither wants nor needs. Even if you think you already know Jack's garage, I would encourage you to watch this new video. It's produced by Jack and features him talking through his thought process and design ideas. It's a very candid look at how and why he chose the features he did. Jack describes his garage as OCD. I'd call it principled. There isn't an inch of his space which lacks purpose. Like his one car to do it all, Jack has just one space to do it all.